Enjoy the Ultimate Audio/Video Experience. Fill one room or every room with your favorite music and video content. Entertainment is central to every smart home and controlling the sources of digital entertainment in even the simplest systems is complex. Watch TV, access your movies, stream video, power up a game or enjoy your music library. Integrate your AppleTV, Roku, Amazon Fire, Netflix, Hulu and more for simple control of all of your entertainment gear. HomeTech will eliminate the clutter, get rid or unnecessary remotes, and most importantly provide you with a system that is easy to use for the whole family. Enjoy access to millions of songs and thousands of artists through popular streaming services—such as Pandora, Rhapsody/Napster, TIDAL, Deezer, TuneIn Radio and dozens more. ​Showcase beautiful cover art, along with artist and track information, on your mobile device, touch screen or TV. Smart entertainment for every TV. Deliver superior sound, stunning 4K video and an incredible entertainment experience in every room throughout the house. And without the clutter! Share your entire movie library, streaming video and satellite channels in every room—no need for set-top boxes and multiple video sources. ​Consolidate all of your audio and video equipment into a closet, creating a clutter-free installation. And best of all, a single simple to use single remote system makes it easy to use for the whole family. 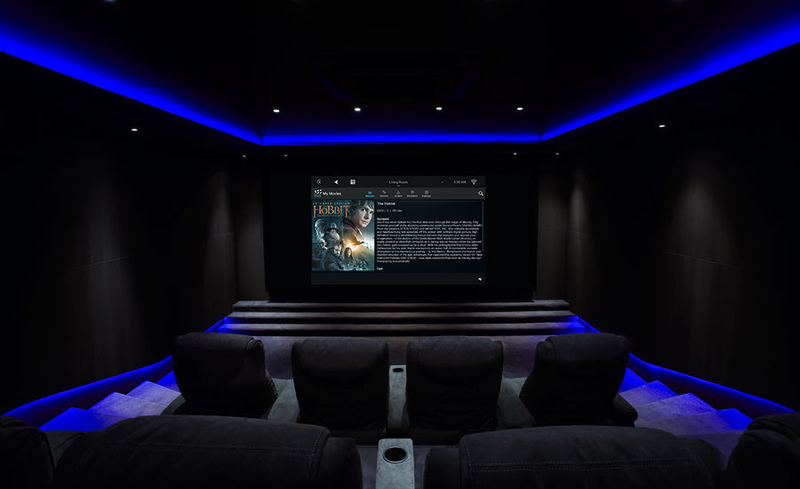 Design a jaw-dropping home cinema that rivals any cineplex. Press the “Movie” button, and the projector screen descends, the DVD player fires up, the surround sound is activated and the lights dim. Incorporate immersive, high-resolution audio, high-definition video, a smart TV or projection screen, and customized lighting to create the ultimate experience. All equipment can be tucked away in a closet and controlled easily from one remote or touch screen.